In the 12-person race to determine the Republican opponent for Senate Majority Leader Harry Reid, things are starting to get nasty. 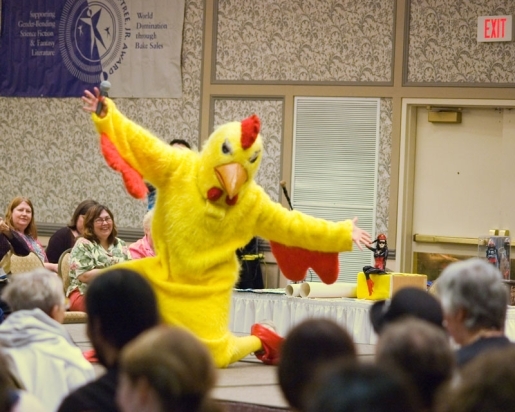 When people go to the polls to vote, they’ll be forced to leave their chicken costumes at home, as chicken suits have been banned at Nevada polling places this year. It’s a strange ban, but it’s for a good reason. Chicken suits are used to mock supporters of front-runner Sue Lowden, after a comment she made in a debate earlier this year. When discussing health care, Ms. Lowden, a former beauty queen and current millionaire casino executive, mentioned bartering for medical care, like when, as she said, “our grandparents would bring a chicken to the doctor.” Of course, people jumped on it immediately and started to use the out-of-context quote against her. Democrats set up a website called Chicken for Checkups to rally the cause against Lowden, and the former front-runner is now in a dead-heat race thanks in no small part to the chicken suits. The damage has already been done by the chicken, and now the suits must be kept at home. Suffice it to say, both sides are claiming victory.